We can now offer a complete recreation of a Voysey bedroom. This is a copy of Voysey's own bed, although he did a couple of these for clients with minor variations. The usual design touches are in evidence, curved top rails, heart cut-outs & made from Oak with a natural finish, as Voysey invariably specified. The bed could be supplied as a double if required ( although there are double beds of his we could do). 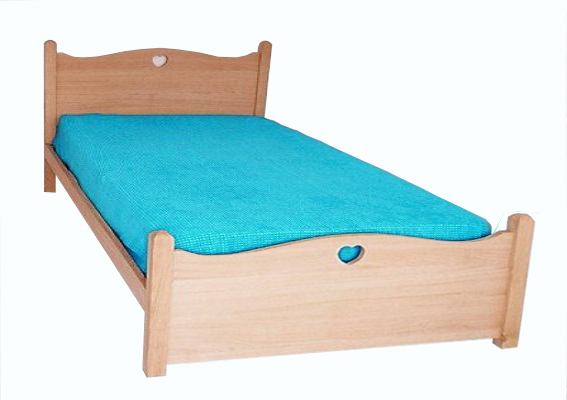 The bed could have a stained, waxed or lacquered finish if prefered. The bedside table is shown on the tables page. We have shown an Oak Arts & Crafts lamp on the bedside table, which fits in with the style. The clothes horse, is also a copy of Voysey's own one. The wardrobe is one of our designs, but is very close in style to his furniture. The only departure from Voysey's style in the robe is the decorative top door panels, which feature Voysey bird designs. All you need to complete the classic Voysey bedroom is oak skirting & picture rails (which we can supply as well). 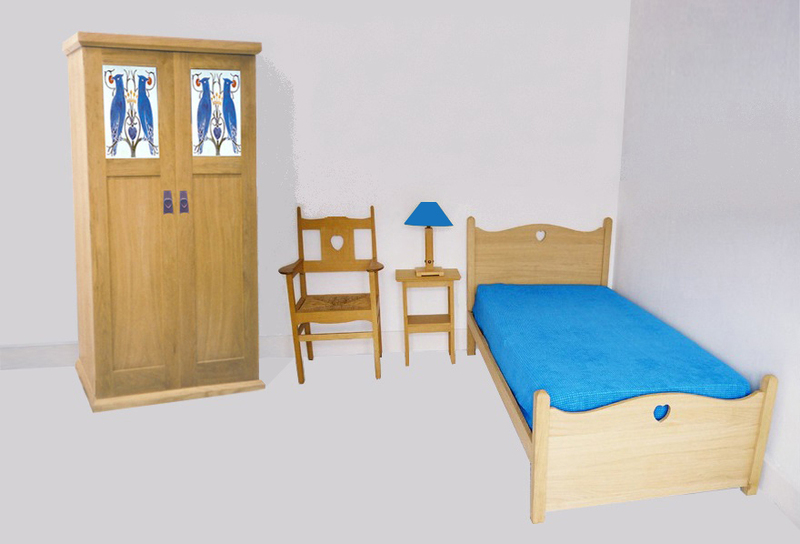 We can supply wardrobes to complete the bedroom, be they freestanding or built it. You could do a run of wardrobes with Voysey Oak doors and a modern fitted interior. There is a page with wardrobes in the main Arts & Crafts furniture section. Also, have reference material for Voysey robes we could use to design you new ones. We can also supply any Oak joinery (ie. picture rails, architrave, skirting,etc ) required to complete the total look of a room. Plus period light switches with light oak pattresses.